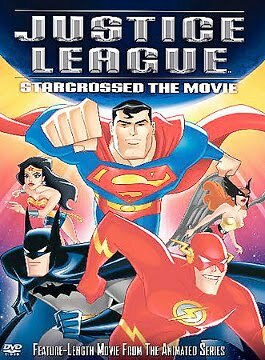 Starcrossed The Movie is technically the three-part series finale of the Cartoon Network series (it changed over to Justice League Unlimited afterwards). Clocking in at 68 minutes on DVD, it seems a bit short for a movie, but trust me when I say, it jams a lot of action in little over an hour. Like the other Bruce Timm-created cartoons utilizing the popular DC characters (Batman, Superman, Batman Beyond, etc. ), Justice League manages to recreate the wonder of the superhero comics while not insulting the collective intelligence of those watching it. Meaning, this Justice League ain’t your daddy’s Superfriends. There’s the action, natch, but the script explores the complexities of the relationships of the characters- Hawkgirl’s feelings for Green Lantern and friends in the League versus her duty to her people, and the betrayal felt by the League. This made these superheroes more than just comic book characters…you feel something beyond just a quick ‘toon fix. The ending, I must admit, brought a tear to my eye, something that hasn’t happened since the end of Iron Giant, and Snoopy Come Home before that. Bite me.